1.9 How To Apply For Tumkur District Court Recruitment 2019? The higher authorities of Tumkur District Court had released the Tumkur District Court Recruitment 2019 Notification to fill the 49 Typist, Stenographer, Peon, Typist-Copyists and Process Server Posts. Those candidates who are very much interested to apply for Tumkur District Court Advertisement 2019, they can apply from 21st January 2019 to 20th February 2019. In the below sections, candidates can get more info of districts.ecourts.gov.in Recruitment 2019 such as educational qualification, age limit, post-wise vacancies, salary details, and simple set of instructions to apply. At the bottom of this page, we had attached the direct link to download the Tumkur District Court Recruitment 2019.
Who are interested candidates can apply this recruitment compulsory you can see the educational qualifications for these posts you can also check the official website districts.ecourts.gov.in to know the more information for the educational qualifications. 8th class from a recognized board. In this section, applicants can get complete information on post-wise vacancies for Tumkur District Court Recruitment 2019. Candidates who are eligible they can see the selection process also. The higher authorities of Tumkur District Court had provided the selection process for Typist, Stenographer, Peon, Typist-Copyists and Process Server they must and should you can see the selection process. Applicants who had performed well in the entire selection process, they will be part of the Tumkur District Court. And, you can see the more information for further information about the selection process you can see the official website that is districts.ecourts.gov.in. How To Apply For Tumkur District Court Recruitment 2019? Candidates can follow the steps which downloading and applying for the Tumkur District Court Recruitment 2019. First of all, applicants have to visit the official site of Tumkur District Court that is districts.ecourts.gov.in. In that go to the Tumkur-OnlineRecruitment Section which is on the left side of the home page. You will get the Tumkur District Court Recruitment 2019 Notification according to post wise. Click on that link according to post-wise which you need. 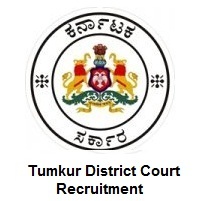 Read the complete details in the Tumkur District Court Recruitment 2019 Notification. If you are eligible, then fill the Tumkur District Court Recruitment 2019 application form. Cick on the Apply Button. Take two or more copies of Tumkur District Court Recruitment 2019 application form for further reference. All the interested candidates searching for Tumkur Court jobs 2019 in India can check this page for all latest recruitment 2019 updates. Find more details and updates about Tumkur Court recruitment 2019, exam results, dates, schedules etc in Sarkari Recruitment. Candidates can bookmark our site that is Sarkari Recruitment by clicking Ctrl+D for more updates on Tumkur District Court Recruitment 2019, and they can also share this information along with their friends. If any of the applicants have doubts, they can comment us in the below section. Thank you.